This guide assumes you already have an existing Forestry Account, a webserver with FTP access, and a repository with a Jekyll or Hugo project. If you don’t have an existing project, check out our Quick start guide, which contains guides and resources for building your first static site. If you are hosting your static site on an FTP server, you should be aware that Forestry will delete all files from your destination directory before writing the new, updated files. This could be problematic if you keep non-website related files in your FTP account. If you don’t want Forestry to empty all of your files, consider setting up your site in an empty subdirectory. Basic, unsecured FTP. Usually served via port 21. FTP secured via TLS/SSL encryption. Usually served via port 990. Also known as FTP with explicit SSL. FTP with TSL/SSL will fallback to basic FTP if a secured connection cannot be established. FTP with Implicit SSL will not connect if a secured connection cannot be established. FTP secured with SSH. Usually served over port 22. SFTP can optionally authenticate using an SSH keypair instead of a username & password combination. Whenever possible, use SFTP or FTP with Implicit SSL to ensure the best security for your webserver. 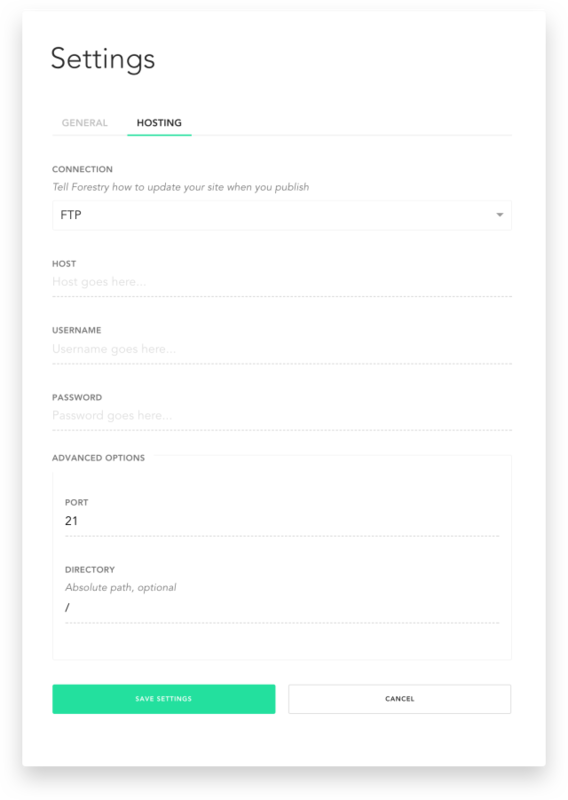 Once you have your FTP credentials and have chosen the correct FTP method for your webserver, navigate to the Settings page of your site in Forestry, click the Hosting tab, and set the Connection option to your desired FTP connection type. Next, enter your webservers host, username, and password. Under Advanced Options, ensure that the Port is the correct port. If you created a new directory to deploy your site to, provide the relative path from your FTP user’s home folder to the new directory in the Directory field. From here on, every time you save or publish a page Forestry will build your site and deploy to your webserver. When saving your hosting settings, Forestry will attempt to connect to your FTP server. If a connection cannot be established, an error will be displayed. Next, enter your webservers host, username, and password. If you’re using an SSH keypair to authenticate, upload your public key using the SSH Key field. If you created a new directory to deploy your site to, provide the relative path from your FTP users home folder to the new directory in the Directory field. 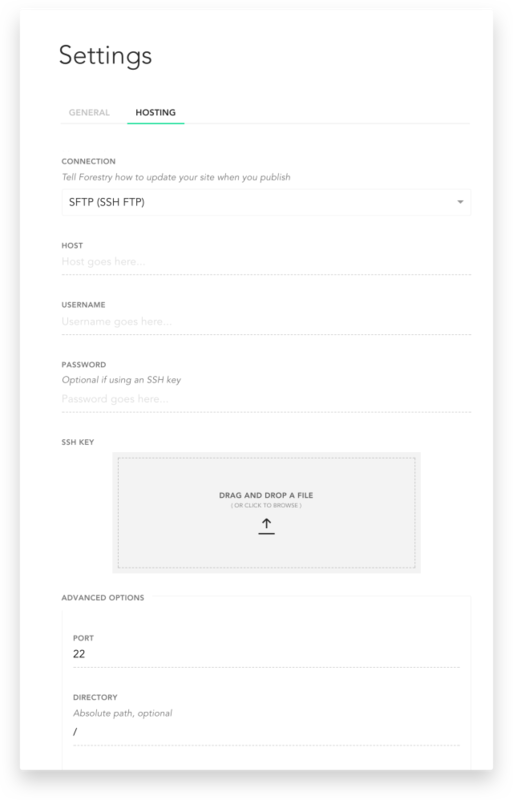 When saving your hosting settings, Forestry will attempt to connect to your SFTP server. If a connection cannot be established, an error will be displayed.